An example circuit (that should work with the PC104 stack's digital input) for the QVB 11134 slotted optical switch is shown below. When nothing obstructs the infrared beam, the phototransistor conducts and holds the voltage low. When the beam is broken, the phototransistor no longer conducts, and the voltage goes high. Because the phototransistor still has significant impedance when it is conducting, we use a large resistor (R2) to limit the current so the voltage will be close to zero when the beam is unbroken. We use a Schmitt trigger to buffer our signal and inject hysteresis to prevent jitter on the output signal. Remember to add a resistor (R1) to protect the IR LED in the switch. 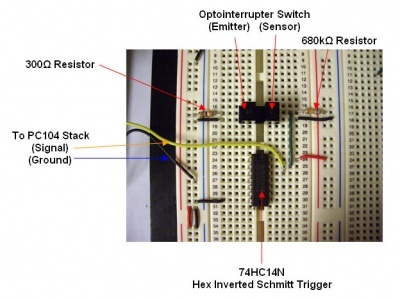 If you are having problems with jitter, you can consider trying the alternative circuit below, which uses a 555 timer instead of a Schmitt trigger. 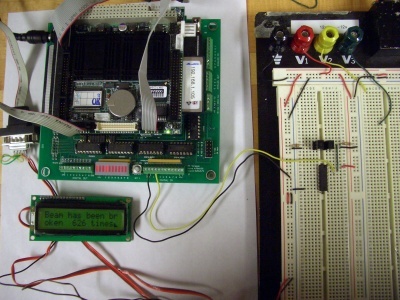 The files below contain an example XPC Target program that will count the number of times the IR beam has been broken, and display them on the Seetron BPI-216 LCD display (on the COM1 serial port). 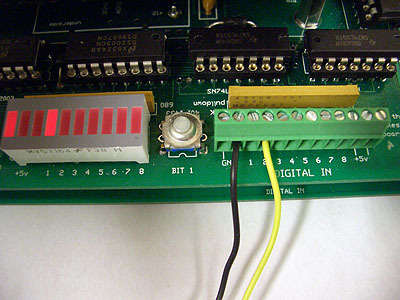 Connect the output of the circuit above to channel 2 of the PC104 stack's digital input port. Depressing the Bit1 button (which sets channel 1 high) on the stack's break-out board will reset the counter to 0. Of course, you can edit the Simulink model to tweak the settings or route the data elsewhere. Unzip both files into your work directory, and open the .mdl file. This page was last modified on 20 August 2006, at 20:08. This page has been accessed 110,445 times.